Ceiling lights flourish illumination in the room while maximizing energy-efficiency, creating a winning product for any home or office setting. Many styles and designs of ceiling lights help any homeowner find the perfect light to add appeal and style to their home. But, since it’s not every day that people buy ceiling lights, you may not know where to start after deciding it’s time to install the lights. LED lights are more popular than other lighting options these days. LED looks more like natural light, reduces energy costs and consumption, and provides the user with a plethora of additional benefits. It creates a sleek, stylish appeal in any setting. It’s also affordable, a quality that anyone can certainly appreciate. 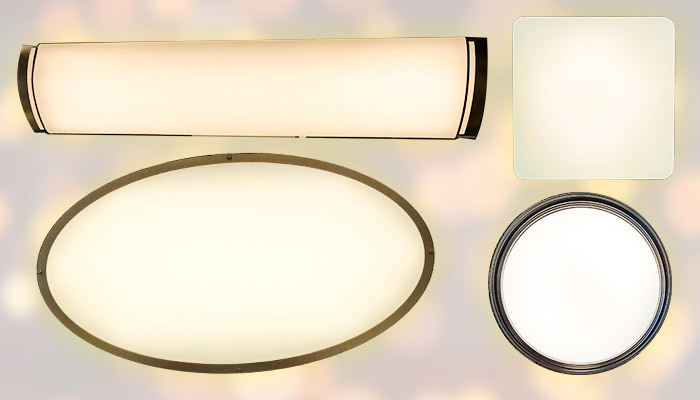 The information below is designed to provide you with a look at a few of the best options for LED flush mount ceiling lights to minimize the hassles of comparing, researching, and choosing. These lights are rated the best by experts and consumers alike. They’re sure to provide the same exceptional results for you as they have for so many others already. Now the only difficult task left is choosing between these great lighting options. Affordable and stylish are two words that come to mind to describe the LB72119 ceiling light. 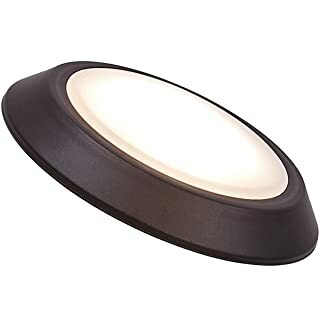 The small 12” round design makes the light perfect for small spaces, but it has lighting that’s powerful enough to pack a punch in even a larger room. The energy-efficient light is energy-star rated and dimmable so you always control the mood. The light has an acrylic bronze finish shade that silhouettes the room, particularly low ceilings. It is ETL safety certified with 1050 lumens capacity for 12 volts. 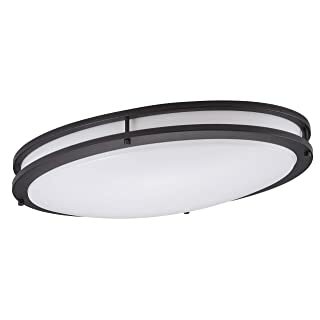 Designed to fit in the hallway, the living room, dining room, or any other space in the house, the Hyperikon 14” round flush LED ceiling light is also easy-to-install in a matter of minutes. Once the light is installed, users enjoy soft lighting with immaculate illumination that allows you to really see what you are looking at. The light is dimmable to 20% so controlling the mood in the room is easy. And, with a long-lasting 45000 hour lifetime and 5-year warranty, there is no worry that you’ll need to replace this light any time in the near future. Designed for use in the kitchen, the Lithonia 2-ft. Brushed nickel mount light also works well in attics and/or in basements. The light evenly distributes illumination throughout the room so you can precisely see what you are doing. This light is at 2,180 lumens. The Energy-Star certified light won’t tack on costs to the energy bills, either. You can dim the light with the press of a button any time you need to change the illumination. And, the light easily installs in a matter of minutes. All that’s needed to install the light is a screwdriver. 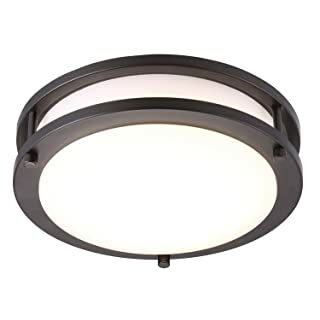 Cloudy Bay’s 10” dimmable ceiling light has a soft black casing to add a touch of color to the room. It’s easy to install, featuring a warm white lighting that accentuates any room wonderfully. Since it is two-inches smaller than the traditional light, it offers less lighting than traditional products but is nonetheless a light that shines brightly in its space. 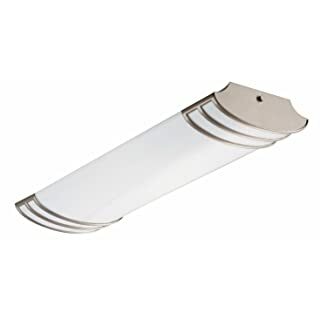 Many people install this light in the hallway or in the bathroom. It works wonderfully for any small space. The light has a CRI90+ rating, which allows more accurate lighting in the room. No one wants to hurt their eyes sitting in a room gleaming those yellow hues of fake lighting that so many lights deliver. Install this light and true color is always what you see. So many lights do not provide true color, but the Cloudy Bay steps up to the plate to ensure that you see the most beautiful of lighting. 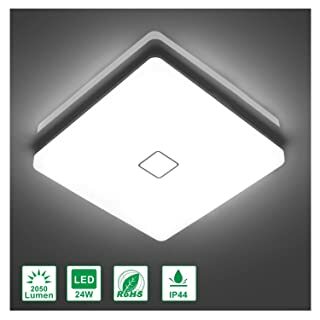 At 17 watts rating, replace a 120v light with this product to reduce energy consumption by 80%! For homeowners looking to add a touch of yesteryear to their home, this is the perfect lighting addition. 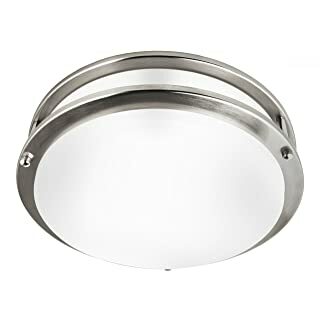 It features a great double ring pendant design in a 10” round shape that easily installs in most any location in the house. The brushed nickel finish adds appeal anywhere that it is placed. Light is dimmable and only cost 15-watts. It is ETL-safety rated, an Energy-Star listed product and backed up with a 3-years warranty. This disc-shaped 12” ceiling light fixture doesn’t require any drywall to install! 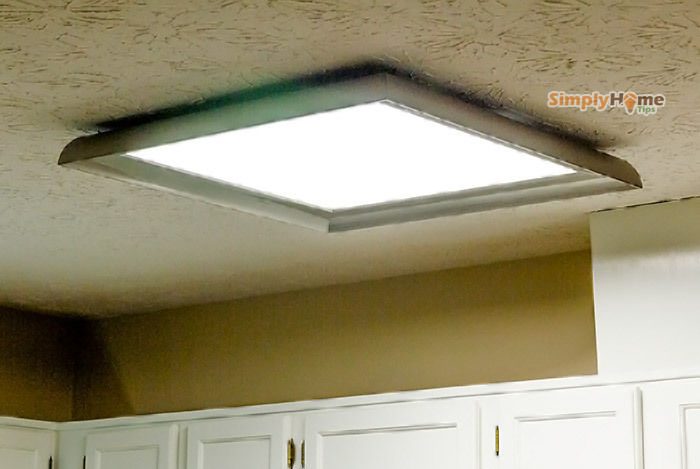 It is one of the easiest lights you will ever place in the house. It works wonderfully when used in a kitchen, a living room, or a bedroom. It’s sleek style features a low profile, thin design. And, the light has a natural base and a frosted lens for added effect! The energy-efficient light offers up to 50,000 hours of lifetime. 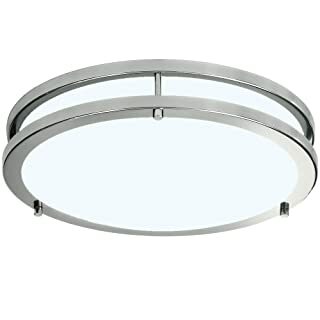 The 24” ceiling light covers a larger area for rooms that need a little more light than the average size ceiling light offers. And, it’s dimable so if you need to tone things down a bit, that’s simple to do with the push of a button. The Eiffel ceiling light is designed for the minimal space. The chandelier style light accentuates the space where it is installed, adding natural lighting to the room. With its glass and metal design with K9 crystals wrapped around the 11” round design, it’s the only decoration needed to make a bold statement in the room. Add the Eiffel ceiling light to the living room, the bedroom, or even place it in the office for a sophisticated enhancement. Quick installation ensures a frustration-free experience. One of the coolest features of this light is that it is designed to minimise the shade of the sun at high noon. 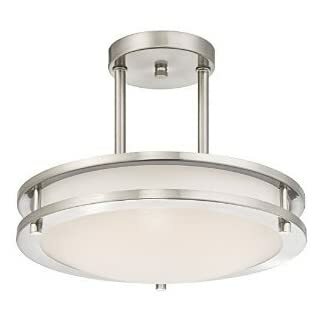 The Airand flush mount ceiling light is designed for installation in a kitchen, bathroom, hallway, or even an office room. The square design adds a touch of style to the room wherever it is needed. And, the daylight light provides a natural appearance to illuminate the room. Made from ABS+PC material, the long-lasting durability of the product is sure to be appreciated. The light offers a IP44 waterproof/splash proof design so it’s perfect for the bathroom. And, the light features a super bright, 180-watt LED energy-saving design that you’re sure to appreciate. This is the perfect light for the minimalist home. It has a low profile under two-inches and a sleek look that adds intrigue to any space. 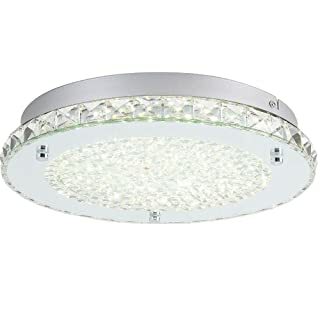 Since the light features a waterproof design, it’s great to install in the bathroom, but also works well in basements and other areas of the home. 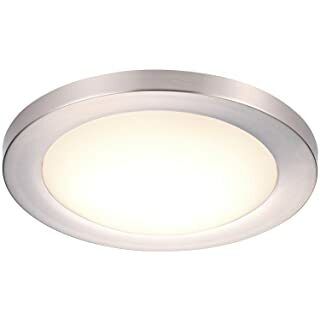 This light rate at 17 watts of power with a white brushed nickel finish. The lens on the light isn’t removable. The 12” design boasts 120 watts of power and with dimmer-compatibility, you always control the amount of light in the room. Which Ceiling Light Should You Buy? With so many great ceiling light options listed here, choosing the right model to install at your home may not be easy. To minimize some of the hassle of choosing a great light, use the information purchasing the purchase process. Where will the light be installed? This is the single most important consideration when choosing a ceiling light. Not only should the light be easy-to-install in the location of placement, but it should also provide sufficient lighting for your needs. How much does the ceiling list cost? It’s fun to compare a few of the ceiling light fixture options to find one that meets your style design and budget. But, be sure that you’ve set a budget ahead of time so you do not spend more money than you should for the product. What type of ceiling light do you want? Round, track, and oval styles are a few of the options. The ceiling light type that you choose is important so consider all of the options! How bright or lumens rating would you need? Lumen or how bright a light can output does matter on the selecting process. Depending on the room/place where you want it light up, different lumen can work better. For example, a 100 sq ft living room might need about 1000 – 2000 lumens, while the similar size dining room would need 3000lm or even more. The lumen required for typical kitchen might be on the 5000lm rank if it; is your only lighting source. How to choose the correct Color temperature? Color temperature, or the LED light HUE being produced can be varied. The popular choice included warm white, bright white, and daylight. To easier understand, bright white on LED will give off a whiter light, sort of like daylight or light in retail stores. On the other hand, warm white and soft white do give more yellowish light. These color temperature can be measured as K, Kelvin with the larger the number before mean the colder (blue) the light hue be. Is your dimmer switch compatible with the light? It is important to make sure that it is compatible or that you purchase a dimmer that works with the light that you buy. Is there a warranty or a money-back guarantee included with the light purchase? Choose one of the lights above after careful research and consideration and you will be satisfied with the look and the light that you add to your home. Use the internet to help research the lights and be sure to ask friends, neighbors, and others for their recommendations, too. Each light listed here is approved and tested by consumers and experts and sold at a price that will not break the bank, even for people who have limited budgets in place. If you want to add superb illumination to any room in the home or the office, take your pick of awesome lights today! You’ll love the way that your space looks after one of these ceiling lights is installed.